Kathryn Ervin, a professor in the Cal State San Bernardino’s Department of Theatre Arts, was one of only 10 people inducted into the College of Fellows of the American Theatre this past weekend at the historic Cosmos Club in Washington, D.C.
Investiture in the College of Fellows of the American Theatre, which originated in 1965 within the American Educational Theatre Association, is one of the highest honors bestowed on educators and professionals in the educational and theatre community. “Our new Fellows are a wonderful mix of accomplished artists from both the professional theatre and academia that make up the American Theatre,” said Karen Berman, dean of the College of Fellows of the American Theatre. 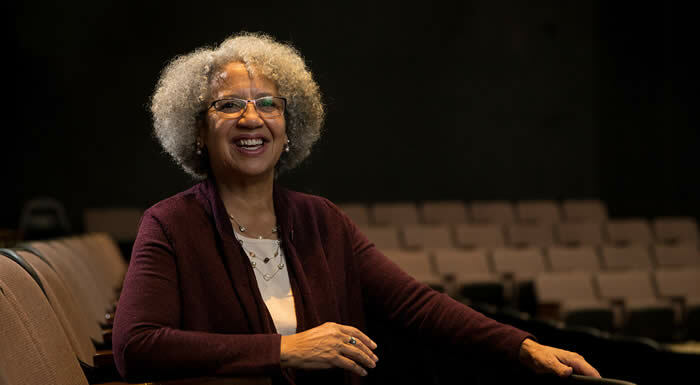 Ervin, who received her bachelor’s from Wayne State University and Master of Fine Arts from Illinois State University, has been a professor at CSUSB since 1989, serving three times as chair of the theatre department. Ervin teaches courses in directing, acting, creative drama and African American theatre, film and culture. “Like so many artists, my work in theatre began because of a play I saw that made me want to be a part of creating theatre,” said Ervin, who was inducted into the College with longtime friend, Michael Dinwiddie. Ervin is an active member in a number of professional organizations, including the California Educational Theatre Association, the Association for Theatre in Higher Education and the California Arts Project, in which she is a fellow. From 1988 through 1994, Ervin served as secretary, then vice president, then president of the Black Theatre Network, the national organization for artists, scholars and individuals with an interest in celebrating the beauty and complexity of black life onstage. She was granted the Black Theatre Network Lifetime Membership Award in 2010, recognizing her service to the organization. As a director, some of her past productions include “THE WIZ,” “Novio Boy” and “HAMLET: the artist formerly known as PRINCE of Denmark.” She also guest directed “Intimate Apparel” at the University of California, Riverside in 2010 and “Ma Rainey’s Black Bottom” at her alma mater of Illinois State in 2007. Her original production of the hip hop opera “Keep Hedz Ringin’” by Rickerby Hinds was a finalist at the American College Theatre Festival in Utah and presented as part of the NYC Hip Hop Theatre Festival in 2002. The primary purpose of the College of Fellows of the American Theatre, which serves as an autonomous nonprofit organization, is to promote and encourage the highest standards of research, writing and creativity in educational and professional theatre through honoring distinguished service and notable accomplishment by individuals of recognized national stature. Visit the College of Fellows of the American Theatre website to learn more about the award and the college.